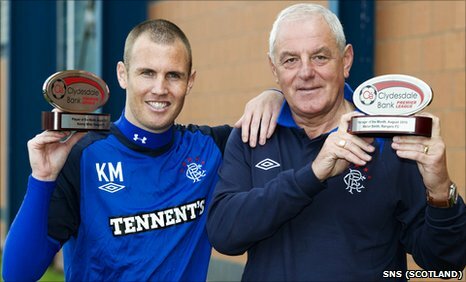 Rangers have claimed two August awards with Walter Smith and Kenny Miller named Clydesdale Bank Premier League manager and player of the month. The Ibrox side won all three of their fixtures last month, beating Kilmarnock and St Johnstone at home and Hibernian at Easter Road. Striker Miller scored in all three fixtures, including a hat-trick against his former club Hibs. Smith is in his final season in football management. "It's always nice to get the awards during the season and it always means you're going through a good spell," said Smith. "Fortunately for ourselves, we've managed to get wins in our first four games. We're satisfied at that although I feel that we could play a bit better than we have done in the four league games so far. "We've had lapses in concentration to a degree. "I would hope that we can start to get up and running. I'm sure we will do because the importance of the games starts to increase as we go." Smith brought Miller back to Ibrox for a second spell in 2008 and the Scotland international finished last season with 21 goals. "It's a thoroughly deserved award for him," added Smith. "He finished last season very well for us and has started where he left off. "I've said on a number of occasions that he's never been looked upon throughout his career as a main goalscorer but last season he got a great number of goals for us, important goals too, and so have his goals been since the start of the season. "Maybe late in his career he's spending a bit more time finding himself in the penalty area rather than the unselfish attitude that he had earlier on. "He's shown us that he can be a good finisher, given the opportunity. He's on target to increase the number of goals that he scored last season." Miller's current contract, like his manager's, runs until the end of the season and the 30-year-old is yet to sign an extension. "Obviously goalscoring, it's been the best that I can remember," said the forward. "Getting six goals in the first four games and getting one with the national team as well, it's been a pleasing start on that front. "I feel the way we've been playing hasn't been that great. Both myself and the team really need to pick it up."